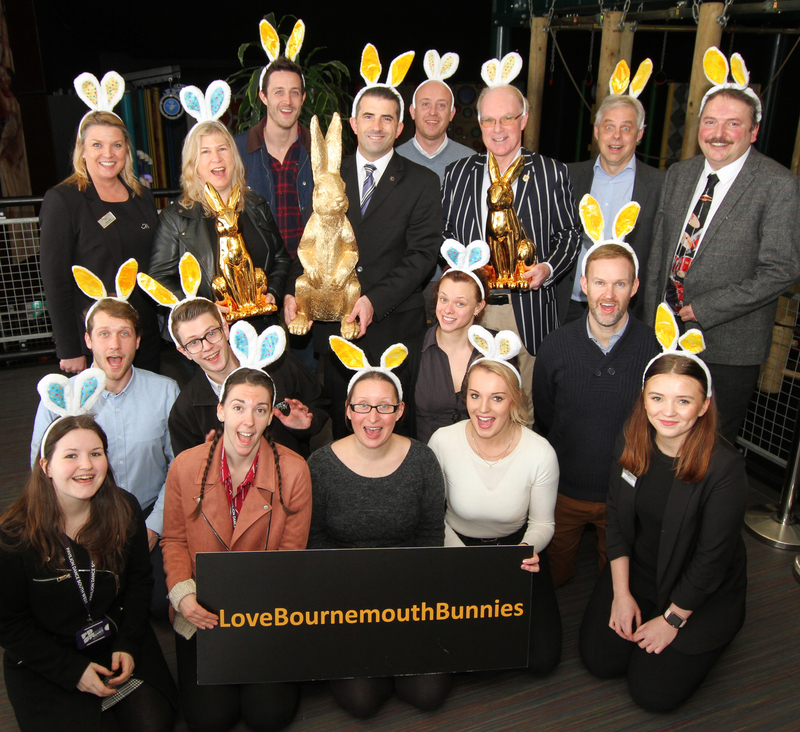 photograph by Hattie Miles ... 14.03.2018 ... Members of the Bournemouth business community join Coastal BID to launch Love Bournemouth Bunnies. Are you ready to have some Easter fun? The biggest Easter hunt in Bournemouth is back! photograph by Hattie Miles … 14.03.2018 … Members of the Bournemouth business community join Coastal BID to launch Love Bournemouth Bunnies. We need you to hop, bound and bounce across Bournemouth’s coastal areas in search of over 100 golden and virtual bunnies. As a reward for finding those pesky rabbits, there’s up to £1000 in shopping vouchers to be won if you can find the most bunnies. Download the Go Bournemouth Coast App to find virtual and physical golden bunnies and post them on social media via the app with #GoBoCoast to help us locate them all. Over 100 golden bunnies have hidden in businesses across Bournemouth’s coast from the Seafront, Southbourne, Westbourne, Boscombe, Tuckton, Pokesdown, Hengistbury Head, East Cliff and West Cliff and we need your help to find them. Take pictures with the bunnies and upload them to social media utilising the app, with the hashtag #GoBoCoast. What are you waiting for? Download the Go Bournemouth Coast app now from www.gobournemouthcoast.co.uk and make sure to follow Bournemouth Seasons on Facebook (@bournemouthseasons) and Twitter (@bmthseasons).